The Porsche 919 Hybrid Evo is the kind of delightful vehicular creation that happens when you let engineers run free without having to adhere to strict series regulations. It is ludicrously fast, and 919 driver Timo Bernhard just destroyed the Nordschelife track record with a time of time of 5:19.546—nearly an entire minute faster than Stefan Bellof’s longstanding lap record of 6:11.13. For exactly 35 years and one month, Stefan Bellof’s 6:11.13 lap record around the Nürburgring’s long Nordschleife course in a Porsche 956C—as in, the Nürburgring course which everyone uses for lap times—seemed untouchable. 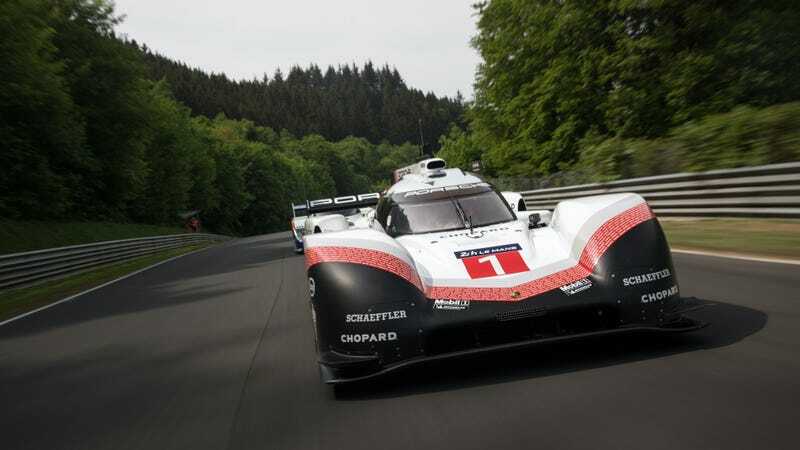 But today, the 919 Hybrid Evo smashed the record time with a 5:31.899 on its first flying lap of the morning. Team principal Andreas Seidl warned us beforehand that this first lap wasn’t even at full send. The goal was to work up to a flying lap—just to be safe—over a series of two to three flying laps. The second flying lap was even faster: 5:24.375. Bernhard noticed a bit too much bounce along the main straight on the first flying run, so the team adjusted the front dampers on the car before the second run. But even that wasn’t enough. They made a few quick checks on the car, and sent it back out. A third flying lap clocked in at 5:19.546. That was the one. The team knew they had to get a lap in early before warmer temperatures hindered the grip of the car’s tires and forced them to run slower lap times, so fortunately, one of their last times in the window of time they wanted worked out. Some speculated there even was a superstition against breaking Bellof’s time given that he died shortly afterwards in 1985 in a crash at Spa-Francorchamps, but when Jalopnik asked archivists that handle Porsche’s historic documents and other paraphernalia at the Porsche Museum in Stuttgart if this was true, they said it was not. Rather, there was just not a car fast enough running the Nordschleife to beat Bellof’s time, or a driver crazy enough to try it. Nor was there much fanfare about the new lap record in 1983 as Bellof was merely doing his job of putting the car on pole position, according to longtime Porsche prototype mastermind Norbert Singer. It’s worth noting that the circuit Bellof drove was a one-off course for Le Mans prototypes to use, so the course today isn’t exactly the same as the course in 1983. 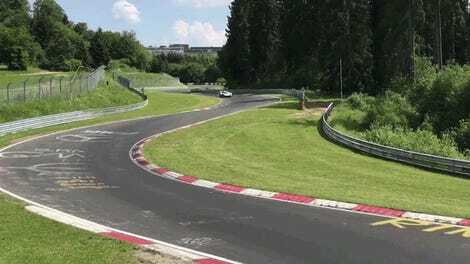 Construction on the grand prix track that connects to the Nordschleife forced racers at the 1983 Nürburgring 1000 Kilometers to use a shorter bypass which made the track just under 10 feet shorter. A 956C like Bellof’s leads the 919 Hybrid Evo on a parade lap at the Nürburgring 24 Hours this year. If anything, though, going longer in a shorter amount of time makes the 919 Hybrid Evo the new undisputed king of the ‘Ring. I was there at the Nürburgring today and it was just as surreal as watching the ultra-quick videos of the car. It’s hard to believe that Bernhard can put up with the forces involved in this car, but surprisingly, Porsche’s engineers told Jalopnik that the car is considerably easier to drive now than it was in 919 trim. The car’s active aerodynamics all but rid it of understeer, according to race engineer Stephen Mitas. For the Nürburgring, the ride height had to be raised to go over the bumps, which reduces the amount of aerodynamic grip the car has, but there is so much grip that it almost doesn’t matter. Bernhard helped calibrate the behavior of the active aerodynamics and other systems on the car, so he was more involved than you might think, plus he told us that he has the ability to tweak many key settings on the fly. A lot of simulation and simulator work went into optimizing the aerodynamics of the car as well as with course memorization. Bernhard wasn’t entirely sure why Porsche selected him to attempt the record for the most famous lap on earth when we spoke last night at a dinner Porsche arranged for the media, however, I’d imagine his five Nürburgring 24 Hours wins didn’t hurt. I’ll be honest: a Nürburgring time is the only lap record I really cared about. The others are neat, but everyone sets Nürburgring times in everything. I spent most of the Nürburgring 24 Hours bothering various Porsche representatives to do it, and they did. So, if they’re taking suggestions, I’d love to see this car fly up Pikes Peak. Thanks in advance, Porsche!